CNG: The Coin Shop. SELEUKID EMPIRE. Antiochos I Soter. Joint reign with Seleukos I, 294-281 BC. AR Tetradrachm (28mm, 16.34 g, 9h). In the types of Alexander III of Macedon. Seleukeia on the Tigris I mint. Struck circa 296/5-281 BC. SELEUKID EMPIRE. Antiochos I Soter. Joint reign with Seleukos I, 294-281 BC. AR Tetradrachm (28mm, 16.34 g, 9h). In the types of Alexander III of Macedon. Seleukeia on the Tigris I mint. Struck circa 296/5-281 BC. 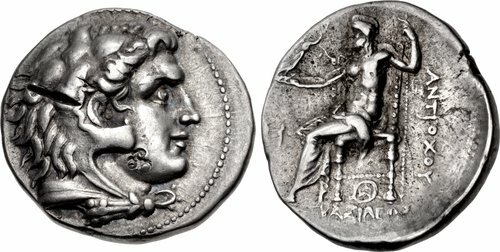 Head of Herakles right, wearing lion skin / BAΣIΛEΩΣ ANTIOXOY, Zeus Nikephoros seated left; H in left field; monogram below throne. SC 120.6a; HGC 9, 17; U. Wartenberg & J.H. Kagan, “Some comments on a new hoard from the Balkan area,” Travaux Le Rider, p. 399, 90 (this coin, illustrated). VF, toned, test cuts and countermark on obverse. Rare. From the MNL Collection. Ex Classical Numismatic Group Electronic Auction 305 (26 June 2013), lot 156; 1990s Balkan Area Hoard (CH IX, 196).